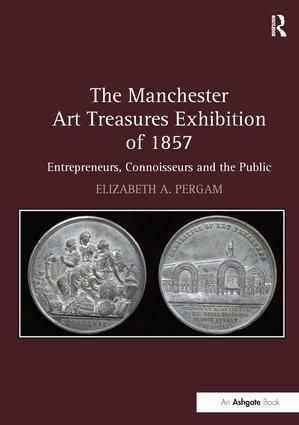 An overdue study of a groundbreaking event, this is the first book-length examination of the Manchester Art Treasures Exhibition of 1857. Intended to rehabilitate Manchester's image at a heady time of economic prosperity, the Exhibition became a touchstone for aesthetic, social, and economic issues of the mid-nineteenth century. Reverberations of this moment can be followed to the present day in the discipline of art history and its practice in public museums of Europe and America. Highlighting the tension between art and commerce, philanthropy and profit, the book examines the Exhibition's organization and the presentation of the works of art in the purpose-built Art Treasures Palace. Pergam places the Exhibition in the context of contemporary debates about museum architecture and display. With an analysis of the reception of both "Ancient" and "Modern" paintings, the book questions the function of exhibitions in the construction of an art historical canon. The book also provides an essential reference tool: a compiled list of all of the paintings exhibited in 1857 that are now in public collections throughout the world, with an analysis of the collecting trends manifest in their provenance. Contents: Introduction: the first blockbuster; Art and commerce in Manchester at mid-century; "What to see and where to see it"; Guiding and recording: from pamphlets to photography; Practicing art history; Profiting through art; Appendices; Select bibliography; Index. Elizabeth A. Pergam received her PhD from the Institute of Fine Arts, NYU. Her current research project focuses on American collecting of Old Master and British paintings. She was the Curator of the Dian Woodner Collection from 2006-2012 and is now on the Faculty of the Master's programs in Art Business and American Fine and Decorative Art at the Sotheby's Institute of Art, New York.